The conference will take place at the OCHOTA campus of the University of Warsaw. We are going to start with registration on June 2nd (Thursday) at 2 pm on the ground floor of the CENT II building (location of the Faculty of Physics). Then on Thursday afternoon we will continue in the lecture hall 0.06 of CENT II on the ground floor, while on Friday we will be meeting in the auditorium on the ground floor of the nearby CENT I building. On Saturday we will move back to the CENT II building where we will continue in 0.06. Lunches will be served at the corresponding locations. The official postal address for CENT II: Pasteura 5, 02-093 Warsaw. 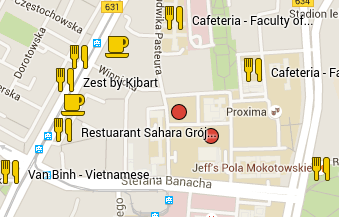 The location of some restaurants in the neighbourhood of the conference venue can be found in the map.